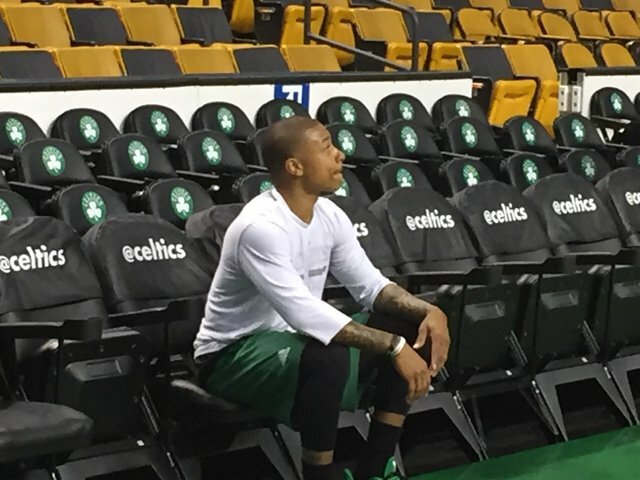 Speaking of early starts, it's kind of messed up the the NBA and ABC couldn't move the time of todays Celtics-Wizards game 1 back knowing what one of it's stars had to go through the past two weeks - culminating in the funeral for Isaiah's sister that took place yesterday. Obviously there's a lot that goes into selecting these times between the league, the networks, the arenas and considering none of these games/times could have been locked in before the completion of Friday night's matchups it would seem there could have been some wiggle room there, although the only other game today is a West Coast start (game 7 between the Clippers and Jazz in LA) so they couldn't just swap the two. @LucidSportsFan They could in theory, but that would be breaking with the scheduling format. Everything is set ahead of time, all the way thru finals. I find it very hard to believe that everything is set in stone I understand that these arenas and facilities accommodate all kinds of events and other teams so there has to be a structure in place, but it seems highly unlikely that they're able to coordinate all of that without knowing which teams will advance and which team will have home court for each round ahead of time. Danny Ainge and assistant coach Jerome Allen are with Isaiah Thomas and his family at Chyna Thomas' services today in Tacoma, Washington. "Tomorrow (the funeral) is a lot more important than Sunday (Game 1)," Stevens said. "If it's difficult it's difficult but it's just a basketball game. So he'll be ready to play. And if he decides when he gets there that it's too much, that's OK. That's fine. This is a lot more important." Beyond overcoming the emotional effect of his sister's funeral Thomas will have flown somewhere in the range of 5000 miles in the past 48 hours, but if there's anybody who can over come all of that it's Isaiah. The guy is tough as nails and if you didn't know it before these past two weeks have certainly brought it to light.